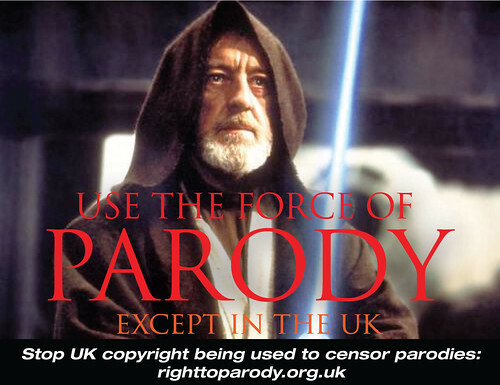 Use the force of Parody: except in the UK, originally uploaded by Open Rights Group. Parody is a powerful weapon for the campaigner. Turning the words of a target of criticism against themselves is a time-honoured way of criticising, and done well (as Greenpeace did in their parody of Volkswagen last year) it’s very effective. It also allows campaigners to use a strong cultural idea to ensure its audience understands a point without lengthy explanations, like the Newport State Of Mind parody. And in some cases it’s just pure, harmless fun, like the ongoing meme of redubbing Downfall. While they would have been “fair use” in the US, all these examples were subject to censorship in the UK using copyright law as the excuse. The Open Rights Group has launched a new campaign to establish the right to parody into UK law, as recommended by a recent government review of copyright law. I think it’s well worth supporting, and if I had any artistic talent at all I’d be contributing to their activities. Maybe you can help?